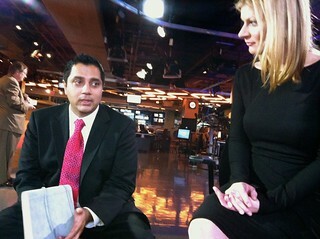 CTV News interviews with Aamer Haleem, Norma Reid, Rob Brown, Keri Adams, and Coleen Christie at CTV BC on October 6, 2011. Big changes are happening at Canada's largest broadcaster. CTV BC announced today two new news shows, CTV Morning Live and CTV News at Noon in addition to a slew of anchor and host shuffling at 5, 6, and 11:30. 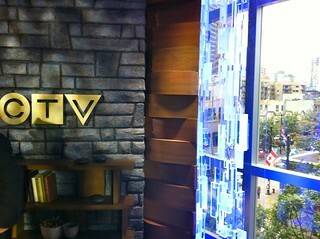 I really enjoyed chatting with the CTV journalists and broadcasters, all of whom I greatly admire. I bonded with Rob over our common Ladner/DSS heritage and the fact that I worked with and was taught by his wife, CBC News late night anchor and BCIT Broadcast Journalism instructor, Rosa Marchitelli. He and Keri sounded excited about the changes and news life in general. Apologies for the lack of photos, but I decided to wisely focus on my conversations with the news veterans. It's not often I get an opportunity to speak with such professionals. I don't take notes so relied on my sharp memory to remember their words of wisdom. It felt odd, not only being at CTV studios across town from CBC News where I worked and often frequent, but also interviewing fellow journalists whom I hope to be one day call colleagues. I was certainly delighted by the industry talk. I live for this kind of insight and look into news and journalism. Obviously, I tried to focus on the changing industry and rise of personality driven stories thanks to social networking. 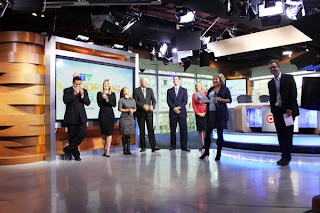 I remember watching VTV Breakfast with Aamer and Christie (very bottom) some ten years ago before CTV BC took over the station and am looking forward to a new iteration of the local morning show. Norma, a reporting veteran, gushed at the opportunity to host morning television. Whereas, Coleen who broke in the morning and has been hosting at 5pm forever seemed cautiously optimistic about transitioning to becoming a night owl at 11:30, despite her morning person ways. Change is good. I don't think viewers often realize how hard reporters and producers work, especially with odd hours, juggling families, and work/life balance. Many of the CTV hosts remarked about their call times (4am for the morning show) and changes in sleeping patterns by the recent changes. On the surface, it seems crazy to me that Bell Media is pumping all this money into extended news coverage when everyone else is downsizing and streaming. No doubt, Bell's recent full ownership takeover of CTV and their background in telecommunications and content providership is behind their strong commitment to news content. I was floored by everyone's enthusiasm and excitement by the changes. It's easy to tell manufactured interest, but their genuine charm got me excited about my chosen profession once again. I look forward to the changes and more local news coverage is always a good thing.